Cobalt is a shiny, brittle metal that is used to produce strong, corrosion and heat-resistant alloys, permanent magnets and hard metals. Silver-colored cobalt metal is brittle, has a high melting point and is valued for its wear resistance and ability to retain its strength at high temperatures. The word cobalt dates back to the sixteenth-century German term kobold, meaning goblin, or evil spirit. Kobold was used in describing cobalt ores that, while being smelted for their silver content, gave off poisonous arsenic trioxide. The earliest application of cobalt was in compounds used for blue dyes in pottery, glass, and glazes. Egyptian and Babylonian pottery dyed with cobalt compounds can be dated back to 1450 B.C. In 1735, Swedish chemist Georg Brandt was the first to isolate the element from copper ore. He demonstrated that the blue pigment arose from cobalt, not arsenic or bismuth as alchemists originally believed. After its isolation, cobalt metal remained rare and seldom used until the 20th century. Shortly after 1900, the American automotive entrepreneur Elwood Haynes developed a new corrosion resistant alloy, which he referred to as stellite. Patented in 1907, stellite alloys contain high cobalt and chromium contents and are completely non-magnetic. Another significant development for cobalt came with the creation of aluminum-nickel-cobalt (AlNiCo) magnets in the 1940s. AlNiCo magnets were the first replacement to electromagnets. In 1970, the industry was further transformed by the development of samarium-cobalt magnets, which provided previously unachievable magnet energy densities. The industrial importance of cobalt resulted in the London Metal Exchange (LME) introducing cobalt futures contracts in 2010. The main ores of cobalt are cobaltite, erythrite, glaucodot, and skutterudite. After copper cathodes are produced from cobalt-containing copper sulfides, cobalt, along with other impurities, are left on the spent electrolyte. Impurities (iron, nickel, copper, zinc) are removed, and cobalt is precipitated in its hydroxide form using lime. Cobalt metal can then be refined from this using electrolysis, before being crushed and degassed to produce a pure, commercial grade metal. Cobalt-containing nickel sulfide ores are treated using the Sherritt process, named after Sherritt Gordon Mines Ltd. (now Sherritt International). In this process, sulfide concentrate containing less than 1% cobalt is pressure leached at high temperatures in an ammonia solution. Both copper and nickel are both removed in series of chemical reduction processes, leaving only nickel and cobalt sulfides. Pressure leaching with air, sulfuric acid, and ammonia recovers more nickel before cobalt powder is added as a seed to precipitate cobalt in a hydrogen gas atmosphere. Arsenide ores are roasted to remove the majority of arsenic oxide. The ores are then treated with hydrochloric acid and chlorine, or with sulfuric acid, to create a leach solution that is purified. From this cobalt is recovered by electrorefining or carbonate precipitation. Nickel-cobalt laterite ores can either be melted and separated using pyrometallurgical techniques or hydrometallurgical techniques, which use sulfuric acid or ammonia leach solutions. Cobalt refining often takes place outside of the country where the ore or cobalt concentrate is initially produced. In 2010, the countries producing the largest amounts of refined cobalt were China (33,000 tons), Finland (9,300) and Zambia (5,000). The largest producers of refined cobalt include OM Group, Sherritt International, Xstrata Nickel, and Jinchuan Group. Superalloys, such as stellite, are the largest consumer of cobalt metal, accounting for about 20% of demand. Predominantly made of iron, cobalt and nickel, but containing smaller amounts of other metals, including chromium, tungsten, aluminum, and titanium, these high-performance alloys are resistant to high temperatures, corrosion and wear, and are used to manufacture turbine blades for jet engines, hard facing machine parts, exhaust valves, and gun barrels. Another important use for cobalt is in wear-resistant alloys (e.g., Vitallium), which can be found in orthopedic and dental implants, as well as prosthetic hips and knees. Hardmetals, in which cobalt is used as a binding material, consume roughly 12% of total cobalt. These include cemented carbides and diamond tools that are used in cutting applications and mining tools. Cobalt is also used to produce permanent magnets, such as the previously mentioned AlNiCo and samarium-cobalt magnets. Magnets account for 7% of cobalt metal demand and are used in magnetic recording media, electric motors, as well as generators. 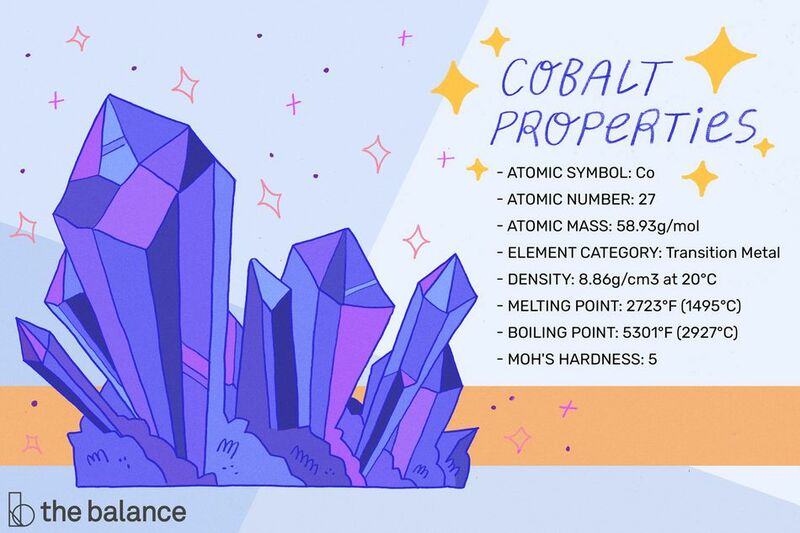 Despite the many uses for cobalt metal, cobalt's primary applications are in the chemical sector, which accounts for about half of the total global demand. Cobalt chemicals are used in the metallic cathodes of rechargeable batteries, as well as in petrochemical catalysts, ceramic pigments, and glass decolorizers. Young, Roland S. Cobalt. New York: Reinhold Publishing Corp. 1948. Davis, Joseph R. ASM Specialty Handbook: Nickel, Cobalt, and Their Alloys. ASM International: 2000. Darton Commodities Ltd.: Cobalt Market Review 2009.